Royal North Devon Golf Club, or should we say Westward Ho! This nostalgic and monumental links course fits firmly into the “must-play” category. In 1864, Westward Ho! opened for golf and it remains the oldest course in England still playing along its original fairways. It is also the oldest links course outside Scotland and home to the second oldest ladies’ golf club in the world, founded in 1868. The first ladies’ golf club was founded at St Andrews, one year earlier. “To go to Westward Ho! is not to make a mere visit of pleasure as to an ordinary course;” wrote Darwin in his book, The Golf Courses of the British Isles. “It is, as is the case of a few other great links, a reverent pilgrimage. Was it not here that Mr Horace Hutchinson and J.H. Taylor, besides a host of other fine players, learned the game?” Originally, the course was laid out by Old Tom Morris and revised in 1908 by Herbert Fowler. Nothing much has changed since then, except the sheep have fattened. When you look out of the clubhouse across the course, you might struggle to define the holes. They simply blend into the surroundings. There are no trees or hedges, except if you count the brambles alongside some of the fairways. There are, however, plenty of reeds and rushes waiting to catch the wayward shot. This is common land golf “au natural”, with a combination of tranquil, flat and folded fairways. Possibly, the only sound you will hear is that of the wind and if you are lucky, the sound of galloping hooves. Here at Royal North Devon, the sheep and horses have life membership. Don’t forget the local rule – if your ball ends up in a hoof mark, you may drop without penalty. Make sure you buy a yardage book if you don’t know the layout; otherwise you might find yourself teeing off in the wrong direction on a few holes. “Finally,” wrote Darwin, “no account of Westward Ho! would be complete without a reference to tea at the club-house. There is a particular form of roll cut in half and liberally plastered with Devonshire cream and jam. Epithets fail me, and I can only declare that the tea is worthy of the golf.” Not only is tea good but also the panoramic view from the clubhouse is magnificent. 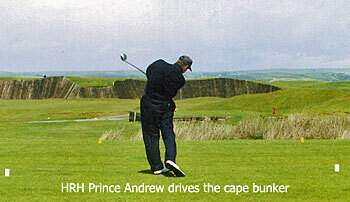 Check out the golfing memorabilia in the museum area and, above all, enjoy the spirit that is Royal North Devon. England's oldest golf course is disappearing into the sea click here for more. I will make myself unpopular here but, history apart, this is one course I would not want to play again. Does not surprise me that its has fallen out of the BI Top 100. No comparison to the two Saunton courses which are both excellent. Eastwood Woe at Westward Ho! RND is a course that requires multiple plays to appreciate more than any other I’ve played. After my first 2-3 rounds I still wasn’t even quite sure there was a golf course out there. I feel differently now. Admittedly we don’t all have time for repeat plays and all look forward to the next course, but then be aware you could be missing out on something. I must admit to BB that I did have a 'mare'.... and yes, perhaps playing courses more than once can make you like them better but... something about RND that just did not click with me! Apologies to all who love it! England’s oldest course is a museum piece. Little has changed in over a century and the entire experience is history lesson. The golf almost keeps pace, though I found too many uninspiring greens (1, 5, 10, 12, 13, 15 and 16) and too many par 5s with no challenge on the second shot to make it a 6 ball course. Still a very good golf course and an experience not to be missed. How can you not love this course? It is a relic. It has not sold out to modernisation. To criticize this course is just bizarre. It is as it was hundreds of years ago. It’s not full of raised tees, the holes haven’t been reshaped, I’m unsure how original the bunkering is but the bunkers are incredibly well placed on every hole. People, dogs, cars all add to the quirkiness. Tee boxes placed seemingly haphazardly but never a long walk to them. I love the first tee shot – horses and sheep everywhere. Sure some of the holes are on flat land but so what? I would hate to think changes would be made to try and make it more interesting because it is a fantastic course exactly as is. You aren’t going to ooh and aah about the conditioning or the architecture but you don’t play RND if you are after that. Note though neither of these are weak or poor just not at the level of Saunton/Enodoc/Trevose etc. When you stand on the first tee at Royal North Devon overlooking the flat expanse of the Northam Burrows, you could be forgiven for wondering where the golf course is. It takes a couple of rounds for the holes to come into focus, and then perhaps a few more before the strategy reveals itself. Westward Ho! brings to mind the first time I listened to the incomparable Miles Davis’s “Kind of Blue”: What on earth is this noise?, I thought. RND is occasionally so wide off the tee that an agoraphobe may be tempted to rush off back to the Clubhouse. This of course gives you options and forgiveness in equal measure. Everyone can usually get a ball in play but get out of position and you can’t really get at the greens. Enjoyable for all levels? Check. The holes route in various directions across the Burrows, exploring the wind from different angles. If you were taking your dog out for a walk, following the golf course might be the path you’d take. As this is common land, you do share your sport with cattle and the occasional horse. Last time I played we had to chase sheep off the 5th green as they curiously inspecting the cup. I even hit one here once, which stopped my shot running into trouble. There’s lot of great golf between holes 4-16 (with perhaps just the short Par 5 at 13 being a little disappointing). There’s variety on almost every hole. RND is fairly unique and that’s always a good thing when there are so many copy & paste courses around. Where else might you have to amputate part of your thumb due to an unfortunate encounter with a Great Sea Rush? That’s risk & reward. By some common definitions it is limited. Conditioning it not great and I’d update many of the bunkers. But I don’t think you’d ever want to change it too much because it would lose something. It’s about the best course it can be and it is what it is: a brilliant relic that remains relevant. Sure, it’s a charming “experience” (antiquity, animals, wind, quirk, clubhouse full of hickory sticks, etc), but it’s also a very good golf course that continues to challenge and entertain 154 years later. You probably need to judge Westward Ho! for what it is and not what it isn’t, and bear it mind that it’s no instant one hit wonder. It may take repeat plays before it fully comes together in harmony, but is all the more rewarding for that. And that’s RND in a rather large coconut shell: More Miles Davis - and less of The Wurzels - than I initially could have hoped for. “Bohemian” is how my playing partner described Royal North Devon when we teed it up here a week ago. “Interesting description” I replied and it sums up RND rather well in that the course is unconventional, idiosyncratic and eccentric. I’m not a member here and I’ve played RND many times, but I’ve never teed it up at 07.30 on a glorious autumnal morning with the course completely empty. It was sheer joy. My partner and I played Burnham & Berrow (both courses), Saunton (West), Bude and North Cornwall, Bovey Castle and RND in the space of four days. To my surprise his favourite was RND. Despite the inauspicious start and finish my partner stated that he could remember every hole. Although the horses were absent last week the sheep certainly were not and it’s hard to forget the spiky rushes and the moonscape and bunker that appears before you at the Cape. RND will never compete with St Enodoc or Saunton when it comes to conditioning, but RND competes with both and wins when it comes to that certain something. Westward Ho! is England’s golfing Stonehenge and long may it remain that way. In terms of the golf course it is one that can hold its own when compared to some of the best in the country. It is regularly ranked in the main 'top 100' lists and has some holes that wouldn't look out of place on many of the Open Championship venues. The layout traverses common land so walkers, sheep and other animals are commonplace on the course where golf and mother nature very much live as one. It is raw links golf in its purest form. The opening hole, a par five of moderate length, is often reachable in two but the lateral water hazard that runs down the right of the hole before cutting across the front of the green has to be given the utmost respect. The second and third are strong holes, which get better with each playing of them, before a thrilling drive over the 'Cape' bunker at the fourth, a delightful short par four with a rolling fairway. The stretch of holes from the fifth through to the 11th are an absolute treat offering plenty of variety, an array of risk and reward shots and some fabulous green complexes. In my opinion holes six and seven are the pick of the bunch but the 10th pushes them close and the tee-shot on the 11th is a joy, albeit a nerve-racking drive to a fairway that appears much narrower on the tee than once you are stood on the fairway. The closing stretch shouldn't be underestimated either and whilst the 13th doesn't quite know whether it is a long par four, or a short five, the up-turned saucer of a green will test your short game to the max. The 15th hole, featuring the 'bear pit', is also a highlight coming home as is the green complex on the 16th. Water must be navigated on the final two holes before you can relax and enjoy the fascinating clubhouse. Anyone who appreciates the history of golf will find the clubhouse a joy to behold. There's very much a relaxed atmosphere to the place and the 'museum' with hundreds of golfing artefacts from bye-gone days complements the feel perfectly. One could spend hours studying the balls, clubs and historic honours boards within. Royal North Devon is ground zero for links golf in England and a course that should be experienced several times to fully appreciate its many virtues. I played here in March 2017. i can empathise a little with the previous reviewer in that a couple of holes on the back nine are rather undefined and 'field' like. the vast majority of holes though are excellent and the greens terrific. This is a true links and many of the holes would sit well alongside the really top links in the country. I am quite stingy with my ratings, i'd like to give this 4.5 stars but having given St Enodoc 5, this is not in the same league, so four it is. I was told that this is a 'marmite' course. It's one you either love or hate. I fall into the latter category. Played there on a beautiful day with a decent breeze up. I was really looking forward to it and soaking up the history attached to the club. Lets start with the positives and there are a couple, The greens are fantastic. True with some devilish breaks about. They are a pleasure to putt on. The par 3's are lovely and all 4 are a treat to play. I loved the 5th. Thought it was the best hole on the course. The members and staff were very welcoming and made us feel at home. The little museum is a nice touch and connects you with the history of England oldest links. Now for the negatives. The course is mostly uninspiring and lacks definition. I got the feeling that we were playing through a flat farmers field and he just decided to up his income by throwing in a golf course. I didn't enjoy the course at all. Unfortunately the fairways and tee boxes were in appalling condition. The road running through the course is a menace and those using it pay no heed to the game going on around them. I know they have right of way but stopping just in front of the 3rd tee box to check you have you wetsuit is a bit much. In high summer when the beaches are packed I can see golfers waiting for a long time before they can play across it. The ramblers are able to roam wild with their dogs and they exercise the right to the best of their ability. We were made to wait on a few occasions while they strolled through the course without a care in the world. There are also lots of sheep and horses about. The horses run about and their hoof prints are everywhere with the exception of the greens. So overall it is fair to say that I was extremely disappointed and underwhelmed with Westward Ho! Wow, the beauty of subjectivity with 2 opposing views and scores within 2 reviews. It is a forum where no-one is right and no-one is wrong ! I can appreciate your sentiments and it can be frustrating a frustrating course in terms of non golfers wandering around, but to me, what you describe are the idiosyncrasies, uniqueness and charm of RND ! It is a shame you found the state of the tee boxes and fairways poor so can empathise in that sense. Fortunately the vast majority of reviewers like marmite ! To complain about RND is like saying the Model T is a bad car because it won't win an F1 or a mashie is a crap club because it doesn't go very far. It should be treated as a relic and appreciated as such. Sure Old Tom Morris & Herbert Fowler would enjoy that quote. Felt like a Pilgrimage. Just a very special experience from some beautiful old school golf holes (3, 4, 5, 7, 10, 16 & 18 are fabulous) to the livestock on the course to the memorabilia in the clubhouse. Please make the Pilgrimage.